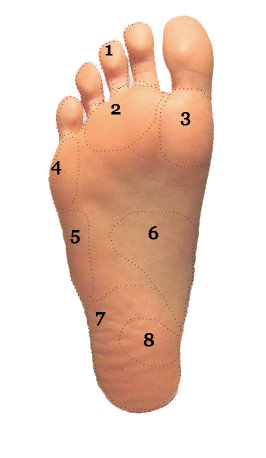 Match the corresponding numbers on the diagram below for a list of conditions that may be causing your foot and ankle pain. Corns - a painful thickening or hardening of the skin, often caused by repeated friction and pressure from shoes and bone spurs. Ingrown Toenail - When a portion of a toenail grows into the skin causing pain and irritation it is an ingrown toenail. If not treated properly can often lead to infection. Athlete's Foot - (Tinea Pedis) a fungal infection on the skin of the foot that usually starts between the toes. Metatarsalgia - Forefoot pain. When the ball of the foot becomes painful and swollen. and swelling in the ball of the foot. Morton’s Neuroma - pain and inflammation in the ball of the foot, and/or toes, caused by the swelling of tissues that surround the nerve. Diabetic Foot Ulcer - a sore on the bottom of the foot or toes that occurs as a complication of type 1 and type II diabetes. Metatarsal Fracture - a break in one of the metatarsal bones of the foot. Metatarsal Stress Fracture - a small break or fissure in one of the metatarsal bones of the foot. Gout - a common type of arthritis found in the foot, caused by the build-up of uric acid in the blood. Turf Toe - An injury to the big toe. Turf toe is common injury among athletes that participate in sports such as track and field, soccer, football, basketball, lacrosse, rugby and even tae kwon do. Stress Fracture - a crack or small break in the bone. Bunionette - (Tailor's Bunion) a foot deformity or bunion that develop on the little toe. Diabetic Forefoot Ulcer - Wounds that develop on the bottom of the forefoot, and are slow to heal. Plantar Warts - a lesion on the skin caused by Human Papilloma Virus. Callus or Corn - The build-up of dead skin in an area. 5th Metatarsal Fracture - a break in one of the metatarsal bones. This meant for educational purposes only. If you have a foot or ankle problem schedule an appointment with a podiatrist - a foot and ankle specialists at Sol Foot & Ankle Centers in Long Beach, CA. Contact your local podiatry office near you by calling 562-433-0478.